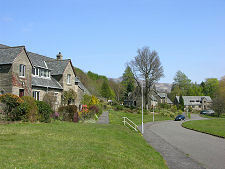 Tarbet lies on the west shore of Loch Lomond some two thirds of the way towards its northern end. 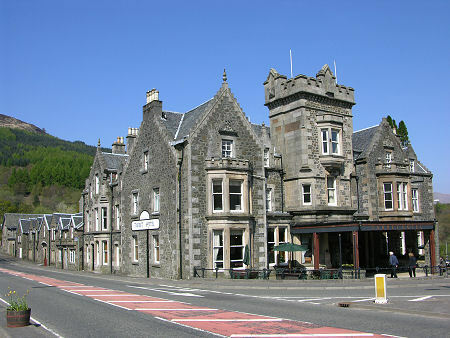 Its focus is the baronial Tarbet Hotel, difficult to miss in the centre of the village. The road junction in front of the hotel is a significant one. Carry straight on when approaching from the south and the lochside A82 becomes the A83 and takes you first west to Arrochar then south through Argyll, eventually to Campbeltown. 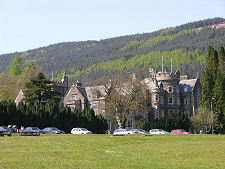 Turn right and you carry on along the side of Loch Lomond and then up Glen Falloch to Crianlarich and the Highlands. As a result, many people simply see Tarbet in passing, en route to the spectacular scenery which awaits whichever choice you make at the junction. 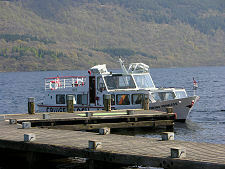 To do so overlooks an interesting and attractive location, and one of the best places from which to enjoy the northern parts of Loch Lomond. 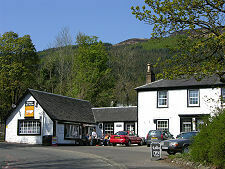 A more minor junction opposite the corner of the Tarbet Hotel nearest the loch leads to a large car park in a beautiful spot. From here a broad swathe of grass sweeps down to the lochside; and to the piers used by many of the boats offering pleasure trips on the loch. 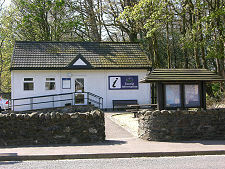 Tarbet also offers a tourist information centre, on the west side of the main road near the hotel. 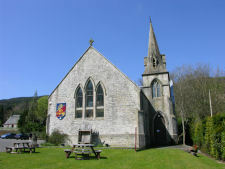 And if you carry on past the side of the Tarbet Hotel you come to the attractive Tarbet Tea room, and a little beyond it a converted church which is now home to the Ben Lomond Cafe and Craft Shop. 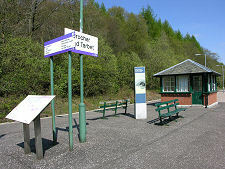 A little further still, a side road leads to the railway station Tarbet shares with Arrochar. Tarbet avoids by one letter having one of the commonest and most confusing place names in Scotland. Tarbert, at the northern end of the Kintyre peninsula (and one of the places you reach by following the A83 from Tarbet) and Tarbert,the main settlement on the Isle of Harris, are often confused for one another. Things would be still more confusing if Loch Lomond's Tarbet had entered the era in which enough people could read for names to become fixed with an additional "r" in its name. In all three cases the name has the same origin, the Gaelic word Tairbeart meaning isthmus or, literally, "draw-boat". 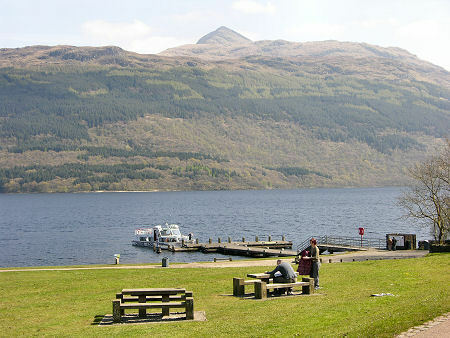 Because Loch Lomond at Tarbet lies just a mile and a half from Loch Long, a sea loch, at Arrochar. The valley that connects them is fairly low lying and was long used as a portage route for boats: and in 1263 Viking raiders dragged their longships between the two to allow them to plunder along the shores of Loch Lomond.